A rendering of the Mercato. 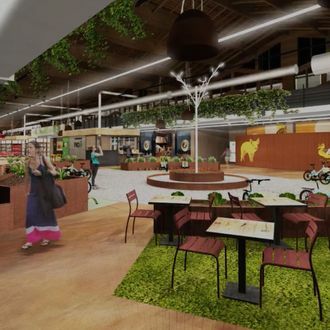 FICO Eataly World opens outside Bologna on November 15, but details about the supermarket chain’s $100 million paean to Italian cuisine have been hard to come by — the site’s developers offered media a virtual walk-through last November, but that’s been … about it. With the launch date now so imminent, though, it seems Eataly decided to welcome in Condé Nast Traveler for a “hard-hat tour” of the site. Based on the scene the magazine describes, the theme park promises to be fairly insane. While it may sound too pedestrian for theme-park-goers on its face, grocery shopping is still the centerpiece of Eataly World. But this will be shopping on steroids: the Mercato is sprawling at 100,000 square feet, all of it dedicated to Italian products. CN Traveler notes customers will be able to stock up on local produce, bread, sauces, basically every cheese the Italians have ever invented, olive oils, a special organic $7-a-liter table wine, and even spaghetti dried for 12, 24, or 36 hours. Your haul could get heavy fast, so Eataly got Bianchi to custom-design a fleet of 500 baby-blue tricycles that are free to use, have baskets plus bags to keep refrigerated items cold, and can be used on a track that runs through the halls of the entire premises. Maybe your ideal Eataly World experience involves even more physical exercise? CN Traveler says daily truffle hunts will occur in a wooded area known as Truffle Land (“individual truffles — both white and black — will be hidden in the earth to avoid any disappointment”), and there’s also randomly a sports complex where you can play tennis or volleyball “for a small fee.” Or just pretend to: Overlooking the courts is a beach-cabana-style bar where you can kick back with a refreshing drink. Naturally, the site will boast serious culinary firepower: It will have outposts of three Michelin-starred restaurants, including Guido, a half-century-old spot on the Adriatic. A spot called Le Soste will give Italy’s best-known chefs a place to do pop-ups or give cooking demonstrations throughout the year. Enrico Bartolini and Massimo Bottura have signed on to curate the lineup. Eataly World has been described time and again as “the Disneyland of food,” so the team threw in six obligatory giostre, or actual rides. Don’t expect Space Mountain, though — they are “interactive multimedia experiences” intended to explain humans’ relationship with things like animals, fire, or the sea. Apparently, they were adapted from Eataly founder Oscar Farinetti’s book Ricordiamoci il Futuro. So, okay, maybe don’t come for the rides. It’d be hard to top the booze corner anyway: Eataly wanted “every single type of Italian liquor” in stock — a frankly preposterous ambition since Italy makes many hundreds of vermouths, amari, and gins, plus every worthwhile city boasts its own funky local spirit, “each as different as its dialect.” As a compromise, Eataly World’s booze specialist Luca Pirola says the selection will have to rotate, but vows bar staff will have at least “1,000 kinds of Negroni” at their disposal. In the same breath, he also tells CN Traveler it’s “an infinity of Negroni,” but the exact giant amount notwithstanding, it’s a lot of Italy’s most famous classic cocktail.